Plywood and OSB (oriented strand board) structural panels come in a number of surface textures, enabling you to choose the texture that is right for your application. The primary methods of creating smooth surfaces on wood include using machining processes such as sanding and/or by overlaying it with resin-treated sheet materials such as Medium Density Overlay (MDO) or High Density Overlay (HDO). Panel surfaces can also be enhanced by other types of laminates such as hardboard, polyethylene, fiberglass reinforced plastic and metals. Surface smoothness of wood-based products cannot be discretely characterized because anatomical variations in wood react differently when exposed to moisture. Various types of wood-based panels can be characterized, however, according to a range of expected performance at various moisture conditions. Panels manufactured specifically for use in industrial markets often use the sanding process to meet more stringent thickness tolerances than found in the manufacturing standards (for example, in Section 5.10.2 of Voluntary Product Standard PS 1-09 Structural Plywood, Form L870. 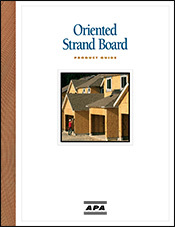 OSB's manufacturing process enables panel makers to add innovative features. Most OSB sheathing panels have a slip-resistant texture on one side, making it rougher with a high coefficient of friction. Reference Oriented Strand Board, Form W410, for more information. 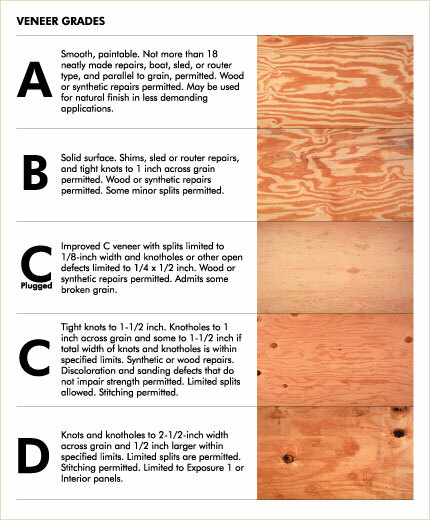 Plywood surfaces can contain any of the veneer grades (see the chart on the right). Oriented strand board surfaces are without large voids and are typically manufactured with a waxed, relatively smooth surface or a screen-grid surface. Wood-based panels can be grouped into product types according to certain manufacturing generalizations. 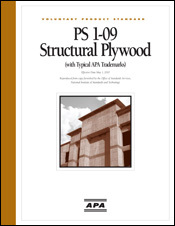 Product types that have been evaluated by APA include Rated Sheathing, Rated Sturd-I-Floor, sanded plywood, MDO plywood and HDO plywood. These products represent a broad range of surface smoothness with considerable overlapping between types. Rated Sheathing panels are not generally manufactured with smoothness or appearance in mind. These plywood panels have surfaces that have open knotholes and splits and are composed of either D- or C-grade veneers. Note that voids in the surface veneers can be up to 3 inches in width, but cannot be deeper than the thickness of the surface veneer. The surface can range from relatively smooth to rough with splits in the panel surfaces. Rated Sheathing panels can also be oriented strand board (OSB), which is composed of compressed strands arranged in layers (usually three to five) oriented at right angles to one another. Because OSB panels are often used for roof sheathing, some manufacturers texture or splatter-coat one side of the panel to increase surface traction. Rated Sturd-I-Floor panels are Underlayment grade and therefore typically have a touch-sanded surface on the face of the panel. Plywood Sturd-I-Floor panel faces are solid and must have at least a C Plugged grade veneer, allowing only very small defects limited to 1/4 x 1/2 inch and splits limited to 1/8 inch in width. Some broken grain will be allowed in surface of the face. The main benefit of this face veneer is a decreased susceptibility to puncture from concentrated loads. The back surfaces of these panels are typically C and D grade veneers having the same texture as noted above in Rated Sheathing. Other common plywood underlayment grades are C-C Plugged and C-D Plugged. Rated Sturd-I-Floor panels can also be oriented strand board (OSB). 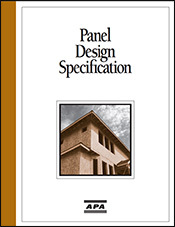 See Panel Design Specification, Form D510. Sanded Plywood panels have A- or B-grade sanded veneer faces in order to fulfill the requirements of their intended end use – applications such as cabinets, shelving, built-ins, etc. A-grade veneer surfaces will be smoother and have less repairs than B-grade veneer surfaces. All types of performance panels can be sanded to specific application requirements by the manufacturer or a secondary milling service. For more information, see Panel Design Specification, Form D510. Medium Density Overlay (MDO) and High Density Overlay (HDO) plywood combine the toughness of Exterior-type plywood with a superior wear surface. These panels are manufactured with a thermosetting resin-impregnated fiber surface bonded to the face or both sides of the panel under heat and pressure. The HDO surface is extremely smooth and durable and withstands severe exposure without further finishing. It resists abrasion, moisture penetration and deterioration from many common chemicals and solvents. HDO usually comes in a natural, semi-opaque color. The overlay gives a soft wood tone appearance to the panel surface. Other colors, such as black, brown or olive drab, are also available. HDO panels will always have an overlay on both sides of the panels. MDO is also manufactured with resin-impregnated fiber but has a lower resin content that creates a very smooth, less glossy surface. The MDO overlay surface may be specified on the face only or on both the face and back. The overlay is smooth and generally opaque, although it may show some evidence of the underlying wood grain. Siding panels with a texture-embossed surface and grooved panels with either smooth or textured overlays are also available. Most manufacturers produce MDO with a wood-tone surface color, although some supply their own identifying brand colors. 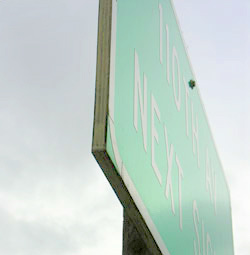 Some also offer factory-primed and textured MDO, particularly for painted signs and residential siding applications. MDO is commonly used to accept paint or other finishes. MDO surfaces are not as durable as HDO surfaces. HDO and MDO typically have B-grade or better face and back veneers. Other common surface treatments for structural wood panels include Plyron and fiberglass reinforced plastic (FRP). Plyron plywood panels have hardboard surfaces laminated to both sides of the panel. These surfaces are very durable and wear resistant. 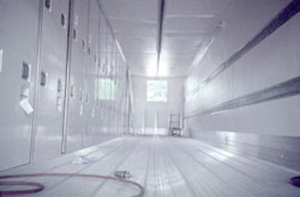 Plyron is commonly used for mezzanine decks. FRP surfaces offer both a decorative and protective surface. The surface is offered in many colors and can be seamless over large areas. It prevents intrusion of moisture and is impact resistant. The overlay thickness ranges from 25 to 60 mills. FRP plywood is commonly used for the sides of truck, trailer, or van bodies, reusable shipping containers and other demanding applications. Other surface laminates are available through proprietary manufacturers. For information on finishing, see Surface Durability. Photo courtesy of Olympic Panel Products, LLC.